Numerology can be defined in simple terms as the science of numbers that help you to become lucky in life. But, it is not easy to win the favour of Goddess of Luck, just by employing the numbers in any form you like. Divination and prediction of one’s past, present and future needs thorough study of mystic influence of the basic numbers from 1 to 9 and how they shape the human lives and also research into astrology, palmistry and such other occult subjects. In addition to scriptural knowledge it needs an in-depth study of thousands of human lives and their successes and failures. The numbers we use to classify humans (from 1 to 9) are mere symbols that represent the planets of our solar system which in turn, represent the human beings. Like good and bad humans in the world there are good and bad “Numbers” also, which if employed in our everyday activities give success or failure. An efficient Numerology Specialist advises his her client whether the latter’s date of birth and the sum total of the numbers assigned to the alphabets are in harmony with one another or not – in other words, the client is under positive vibrations of the cosmological forces or otherwise!. The Hindu seers and wise men of the ancient times had thorough knowledge of the planets, their orbits and their influences on humans. They gave us the numerals in Sanskrit thousands of years ago, which spread to countries far and wide. They came to be mistakenly called hundreds of years later “ Arabic” numerals due to the onslaught of time! They gave us the magic number called “Zero”. And it is they who gave us the sciences, especially, the occult sciences such as Astrology, Palmistry, Numerology, Physiognomy and the like. They taught the world how to make use of their findings and lead a healthy and happy life. But the language was esoteric and the teachers were but a few. During modern times, as predicted in the Puranas, English became a popular language and Numerology was codified by great teachers and authors like Sepharial, Cheiro and the last, but not the least, Pandit Sethuraman of India. 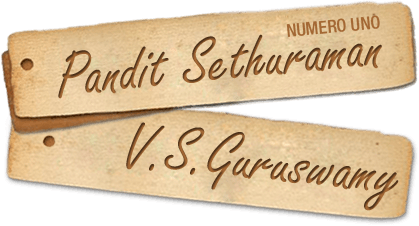 Unlike the early practitioners of Numerology Pandit Sethuraman is remembered even today many years after his demise. It is because he was the first and the only one in the world to give readings for 108 numbers on the basis of his relentless quest for knowledge. All the previous masters stopped at number 52 or even less. Thus Numerology has come of age. The classic on the subject of Numerology “Science of Fortune”, authored in Tamil by Pandit Sethuraman is now available in four other languages including Chinese. It is an international best seller! Pandit’s son and disciple, Mr. V.S. Guruswamy has brought out the same book in English in e-Book form and has won world wide acclaim. If Numerology speaks of signs of fortune in your life, the only tool to find and exploit them is “Science of Fortune”!